A very gifted group of individuals poured their heart and soul into creating Star Wars: The Clone Wars, a CG-animated series that ran for 5 seasons on Cartoon Network. 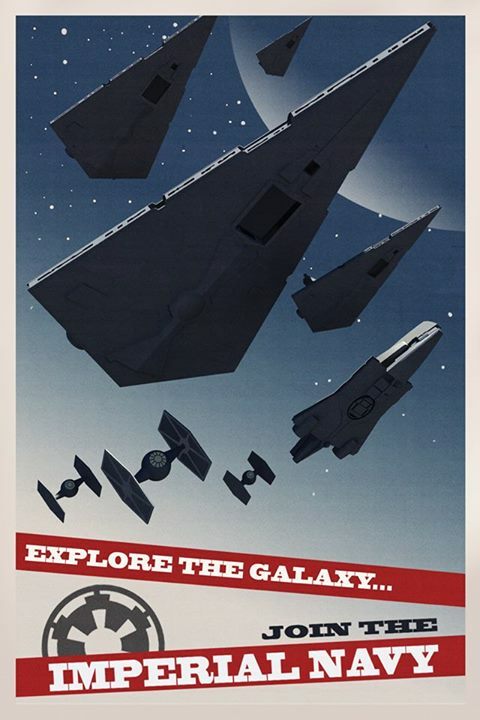 After the purchase of Lucasfilm by Disney in 2012, all thoughts were turned toward returning to the timeline of the Original Trilogy and the planned sequels. The show was dumped to another time slot before being unceremoniously and unwisely cancelled in 2013. Fans of the show, aware (thanks to the fantastic communication of show-runner Dave Filoni) of a backlog of content already in production, wondered if any of the material would see the light of day. 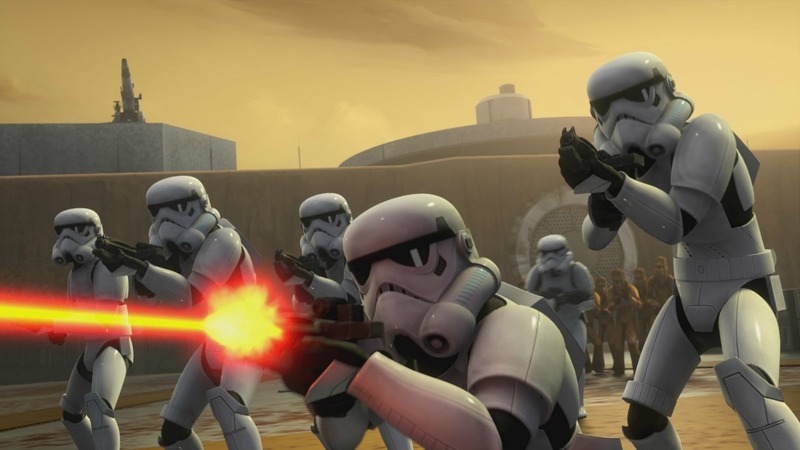 Filoni and his team were allowed to cobble together what they could finish with reasonable effort and expense, and fans had to wait until March 2014 for the abbreviated 13-episode 6th season (“The Lost Missions”) to be put out exclusively on Netflix. The output of the show was 125 episodes and a feature film – that’s approximately 48 hours of new content set in the SW galaxy! That’s not counting the 25 mini episodes of the first Clone Wars 2D-animated micro-series by Genndy Tartakovsky from 2003-2005, which would bring the total to 150 episodes and 50 hours. That’s almost four times as much Star Wars content as the feature films provided – but since these weren’t the original films, some weren’t interested. That’s just very silly to me. Don’t make the same mistake by skipping Rebels. 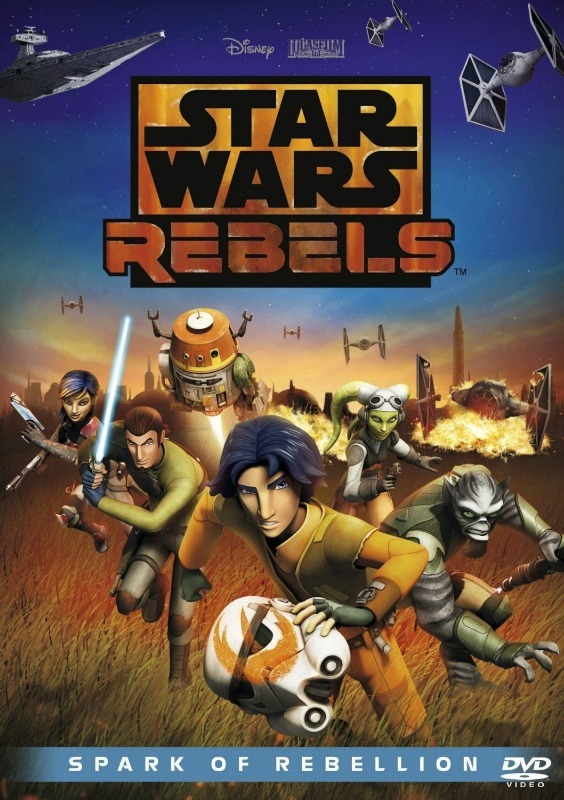 Interestingly, the show premiered on the same day that the Star Wars: The Clone Wars animated series debuted in the US six years earlier in 2008. Rebels has already been renewed for a second season by Disney, and it’s likely to be be a big part of the lead-up to the future films. Star Wars Rebels is set five years before the events of Star Wars: Episode IV – A New Hope, when the few remaining Jedi are scattered and the Empire is in full swing. It’s an awesome time in the saga, full of potential and depicts what it was like before Luke and company started wrecking the place. Knowing more about the height of the Empire is fantastic, and I suspect I wasn’t the only kid wondering what happened in the years leading up to the original movie. I’ve always considered this era the most fascinating and I can understand why Disney wanted to quit the Clone Wars and get back into the Tie Fighters. The promise of this time still needs to be backed up with good stories, and they seem to be on the right track. 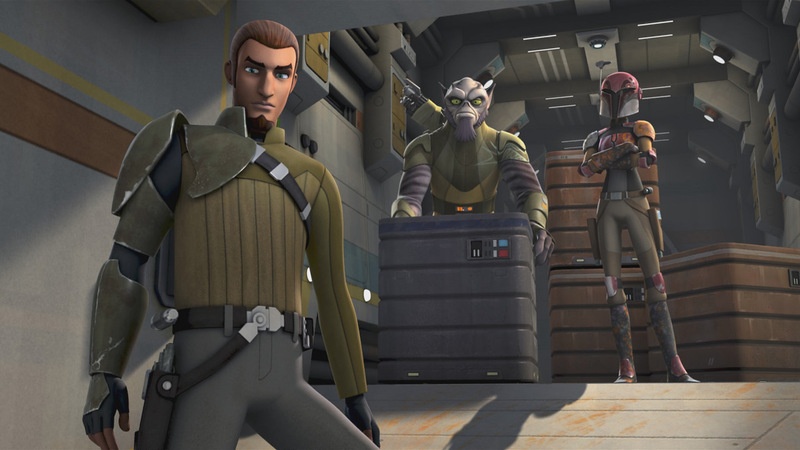 The series opens by following the exploits of an orphan named Ezra who scratches out a living on the streets before running across the path of a team of semi-criminals out to steal the same cargo of the Empire. The group of malcontents make up the crew of the starship Ghost and contain a diverse set of personality traits that seem to have been picked by focus group for maximum interest. That’s not really a bad thing, just be aware that you may experience sensations of déjà vu with some of this. The parallels to Firefly and other stories are unavoidable. It is undeniably a kids show; I’m not sure why that’s supposed to be a problem. The original films were for kids, no matter how many fanboys insist otherwise. The Clone Wars was a kids show, albeit one that covered terrorism, suicide and torture at times. Depending on your perspective, being “for kids” is either a tremendous insult or a promise. Being “for kids” can certainly imply a dumbing-down, but it also hopefully carries the suggestion that you’re in for a good time; that the work in question will be meant to be enjoyable. That’s really important. And Rebels fulfills on that promise. Watching the premiere event was like watching a movie and a fun one at that. As much as I loved The Clone Wars series and admired the skill involved, it never really was able to completely capture the spirit of the 1st film. That’s not a criticism – it was depicting a different, more complex time and a sensibility to match. Of course the subject matter of the original films was never soft – they do have the word wars in the title after all – but the spirit of adventure made it all seem more fun and carefree than it really was. From the moment you see Stormtroopers march on screen you can’t help but be transported to that time and feeling. I can’t overstate how enjoyable it was to see Tie Fighters streaking across the skies and hearing the familiar sounds of their cannons and the troopers blasters. The story is good, not great, and I’m absolutely certain that the show will have a cartoonish feel at times. The previous series certainly did and so did the films – yes, even the OT. The Clone Wars series seemed to alternate at times between adult stories too dark to let my daughter watch and ridiculously silly stories too goofy for me to watch. But most of the episodes lived in the comfortable middle ground where everyone could enjoy the wonder of the this galaxy and I expect Rebels to do the same. Star Wars Rebels, set five years before the events of Star Wars: Episode IV A New Hope, tells the story of the Rebellion’s beginnings while the Empire spreads tyranny through the galaxy. Five years before the events of Star Wars Episode IV: A New Hope, the reigning evil Empire continues to tighten its grip of power and fear throughout the cosmos. But even amidst the tyranny and oppression of these dark days, a glimmer of light emerges. 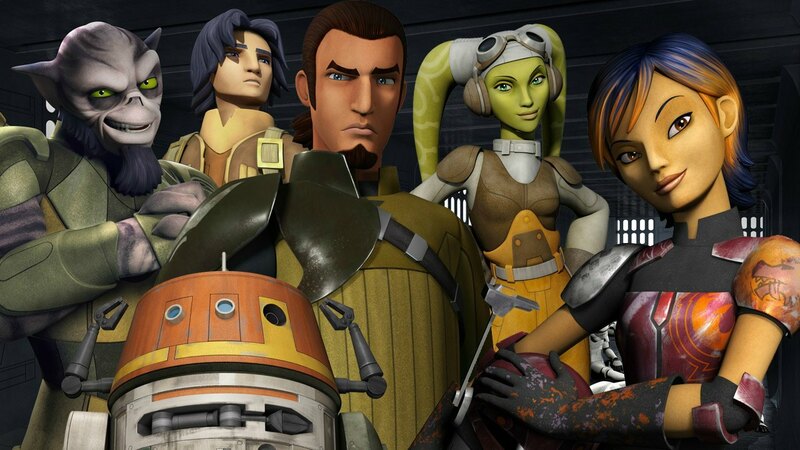 Meet the ragtag crew of the starship Ghost : Twi’lek pilot Hera, street-smart pickpocket Ezra, team leader Kanan, alien enforcer Zeb, explosives expert Sabine, and Chopper, the cantankerous Droid. Together, they embark on action-packed adventures, battle ruthless villains, and ignite the very first Spark Of Rebellion against a surging tide of Stormtroopers, TIE fighters and the mysterious Inquisitor.